The Victoria | Pub Quizzers | Find a pub quiz near you, now. 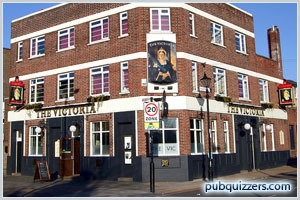 Pub quizzes take place at The Victoria, Mile End on Wednesdays (fortnightly) at 20:00. Entry is £1.00, you can have up to 6 people on a team. There are prizes of spot prizes, drinks. Happy quizzing! 2nd Prize: Round of shots. Prize for best team name: Multi-bag of crisps. Wooden spoon / last place: Signed toilet roll.